In fact, we’re all broken, Lord. To learn to love and to live. Uncomprehending that we’re seeking You. Nor is it contained within possibilities. You are the source of True Peace. Yet experienced through simple trust in Your Word. My husband is an alcoholic. He is verbally abusive to me when he drinks. He scares the kids because he yells an is mean to me. I want to take the kids an leave but I can’t afford it on my own. 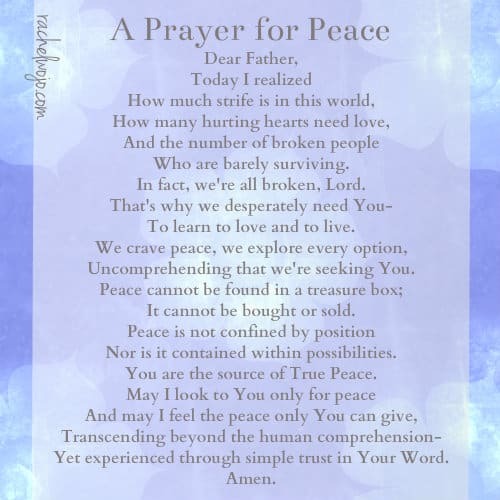 My children an I desperately need peace. We need God to make a way where there seems to be none. Tamara- God loves you so very much. He will make a way- He is the God of the impossible. Jesus, please be with Tamara and her children right now. Please provide a way of escape for them and protect them as only You can. Tamara- please seek outside help as soon as possible. Call a reliable friend or family member and talk to them. Inform someone in authority of your situation so that they can help you. My prayers are with you and yours. Hi Rachel 🙂 thank you for sharing this beautiful Prayer and the scripture is one of my favourites. I saved the Prayer to my files, but I wanted to ask your permission to print it and share with my Prayer group?